project, you should pause for a moment to think about your intended use for it. Having flexible space beneath your living room will provide you with lots of options in the future to design it into whatever you please. At this point, it should be pointed out that installing a drop ceiling in your basement will make the room feel cheap. If your goal is to maintain the look and feel throughout the house, it is not the best option. In addition to making your basement feel cheap, it also will make it feel significantly smaller than it probably is. With that said, below are some basement renovations and remodeling tips to guide you through the project. Most homeowners tend to overlook this design type. Many are not used to buying furniture, so they forget to incorporate built-in storage spaces and shelves. These work to maximize the space in our basement. They also have the added advantage of being cheaper. You can always check the rooms adjacent to your basement for some extra space. However, be sure to keep yourself in check – don’t overdo it. Too much of the woodwork project may end up being expensive and may not give you great returns on your investment when you decide to sell the house. It is always a great idea to keep things inexpensive and simple. You will be shocked at the beauty it adds. Provided you are not being sneaky and installing an air purification system to mask the musky scent of mildew and mold in the basement, it is a great idea. The purification system will have your basement smelling great to match its beautiful design. 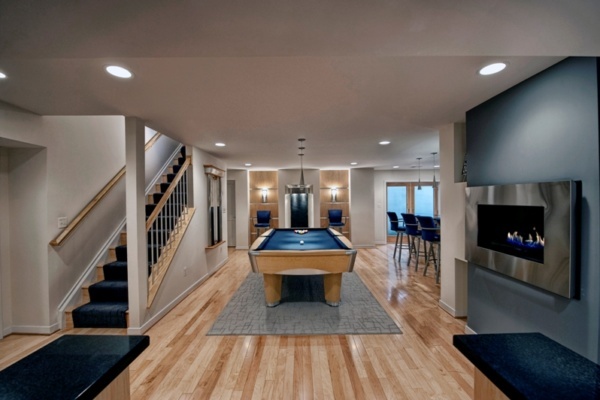 There are numerous ways to make your basement feel inviting. One of the ways is to incorporate an open stairwell design. This opens up your basement and connects it to the rest of the house. Also, to this, it helps you to save some costs on energy bills, as it allows the basement to be flooded with natural light. This is a simple basement remodeling project. The beauty of it is that it just requires some wood glue, a finish nailer, and a few other woodworking tools. But here is the thing about a basement stair railing – you need to plan. If you will at some point need to move large furniture to your basement, you should probably hold off on installing the stair railings. Other than that, the stair railings are not only beautiful, but also add some safety to your basement stairs – especially if you have kids. If you notice your basement is cold, before you proceed with basement renovations, check to see if the air conditioner is working great. If it is not, you best repair it first. Aside from that, you should consider installing a carpet. With carpeting, strive to find the best quality there is. It will make the basement feel more inviting, comfortable and warmer. Any remodeling or repair project can prove to be expensive. As such, it is a good idea to recycle items in the basement. You can also purchase reused items from second-hand stores. These will help you cut down on your costs and help maintain a clean environment, as well. What Are The Benefits Of Basement Waterproofing in Ottawa?